I’m assuming you’ve read the preceding essay. While the previous essay tried to model society by starting with individuals, this essay tries to describe society on a systems level. Our initial view is that our moral decisions are rational and based in reasoning that is concrete. As our understanding of evolution progress, we recognize that morality is a result of evolution. For example, until a few hundred years ago, those who questioned racism, sexism and religion were silenced because their ideas were ahead of their times. When the time was right, then those ideas were accepted. Morality is a mechanism that lets us adapt to the environment quickly. As the environment changes, morality chooses those ideas best suited to the new environment. The idea is that changes in morality actually are results of changes in underlying economic situations. Another example: Did the British leave India because they suddenly developed enlightened feelings on the colonial condition, or because it was no longer economically tractable to hold on the colony? Did women’s gender roles change because World War II meant that their positive economic contribution made sexism economically, not morally, untractable? These ideas are distasteful, that our moral ideas came about through economic necessity. Here, morality is a shortcut to dealing with more complicated ideas. Morality lets you fully believe in an idea without needed to reason through it. An over-riding all consuming moral belief in the wrongness of an idea is infinitely more powerful than a rational economic argument. Social norms are subject to evolution. There are a variety of fringe social norms waiting to move to the mainstream if the evolutionary conditions are right. Morality helps coordinate mass action on the level of society – instantly. To react and to guide. That is why memes go deep, why beliefs are hard to shake off, because survival depends on them being hard to shake off. A friend sagely pointed out that politicians take certain decisions for rational economic reasons, and then sell them using moral arguments, not economic ones. The end result is the same – the conditions have to be right for certain moral beliefs to arise. Jante Laws of Scandinavia: These laws possibly arose out of a need to enforce absolute cooperation in society to ensure survival in the harsh Scandanavian climate. Interesting studies have been carried out on bonobos and chimpanzees: Bonobos live in a resource rich, less competitive environment which allows cooperation and low levels of violence. Chimpanzees live in a harsher, resource scarce environment which strains social bonds and encourages conflict resolution through violence. More here. It’s interesting to think about the “Bleeding Edge of Morality”. That is, the way morals are gradually relaxed around the world. Society has become more permissive with every generation. Evolution pushes morality further and further. The question is, where will it end? Will it end? Will all social structures be dismantled, and will social norms no longer impinge on our lives. Or will social norms simply change their nature? To understand how societies evolve, knowing history is useful. It helps to look at societies the way Gibbons’ “Rise & Fall of the Roman Empire” looks at society. Look at a society’s ideas, morals, laws, conventions and conduct and see how it fits the environment. See what lead to those and how those made a society respond to the environment. And see how they gradually fall out of fit with the environment leading to the society’s eventual failure. How does society evolve? If evolution occurs at the individual level, then for new adaptations, a new generation with new genes must emerge. There is a ‘time step’ for change. We need a new human generation for change. But societies change much faster using cultural evolution. A society’s cultures are it’s ideas, it’s principles, it’s morals, ethics, values, traditions, conventions, laws, religions — anything that tells its members how to behave. And culture is always in flux. The cultural flux means change can occur on demand. Society adapts to the environment, which is Nature and also other societies. The environment is also intra-society. Multi-level selection says that selection takes place between groups within a society, for example between political parties. Thus, different parts of society are reacting to the society itself and selecting. Thus a society also evolves to itself, though of course eventually it must result in adaptation to the outside environment. 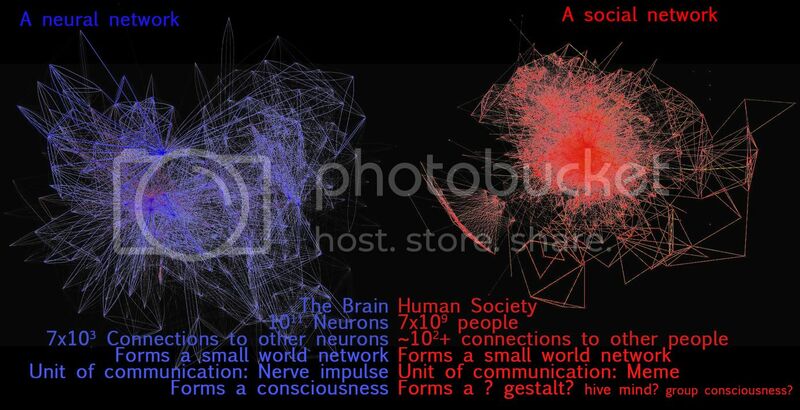 Here’s a comparison of neural networks and society. It’s interesting to think of society in terms of processing power. There are interesting parallels between a society and the brain. You could even go so far as to say that society is conscious; it’s conscious far longer scales than we are. A society might respond in months or years. And perhaps a societal ‘thought’ corresponds to things such as social movements and revolutions. The argument is that society is a complex, layered biological information processing entity. It takes the environment, processes it in the form of information, and gives rise to adaptation. Of course, this is gross oversimplification. The environment is infinitely complex. You cannot process infinite complexity. Here, the concept of a search space is useful. Imagine a problem with one degree of freedom. Say you’re driving to the beach, you want to get there quickly but you want to save fuel. There’s a certain speed which will give you the best tradeoff between speed and fuel consumption. You have one degree of freedom – speed – which you can work with to solve your problem. Your speed forms an axis, the X-axis by convention. Now, what if you could either take streets or take the highway. Another degree of freedom. The Y axis. You have two degrees of freedom – the XY plane – and the best solution could lie anywhere in the plane. Add another degree. A third dimensional search space – XYZ axes – and your solution lies in three dimensional space. You can continue to add dimensions to model all the degrees of freedom you have. But what if you don’t know how many degrees of freedom there are? Then there are ways to arrive at your solution that you are unaware of. At the same time, even with the degrees of freedom you know of, the combinations could be too many to work through. Imagine you at the origin and you see multiple axes (representing degrees of freedom) radiating away into space. There are too many axes to explore. The search space is too vast to work through. The only solution is a random approach. And this is how evolution and how we solve problems. We come up with a number of differentiated solutions, which are effectively random explorations of the search space. We test them and iterate! This is how we flesh out a search space and try to reach the optimum solution. In human history, as our ability to reach truth increases, we slowly transition from roundabout methods of imitating truth to directly reaching truth. A society’s culture is it’s ideas, it’s principles, it’s morals, ethics, values, traditions, conventions, laws, religions — anything that tells its members how to behave. Societies form small world networks which allow fast propagation of memes. Memes are what a society uses to adapt to the environment. If it weren’t for memes, a society would have to wait upon genetics. Adaptations are no longer carried in the physical structure of our bodies, they are carried in the mental structure of our minds. Our minds are the hardware and culture is the software. The downside is that an idea is tested by broader society. Thus, ideas that are ahead of their time can be rejected, simply because they are incomprehensible to broader society. To be accepted, there must be a comprehensible bridge between existing memes and the new meme. The upside is that harmful, clearly detrimental memes will always be rejected. Narratives appear to be how we learn, how lessons are spread, how conduct is taught, how a society stores its ideas. It’s how we spread culture and imbibe information. It’s interesting how the underdog good guy always wins in a narrative. Why does good always win? Why is heroism glorified? Perhaps because these are the very values that make a society function. In order to function, a society needs people to be altruistic and heroic, people who put society first. Millenia of selection on the social scale has lead to humans selected with this psychological make-up. A make-up that understands narratives, that takes up the inherent morals, and that acts on them to form an adaptive, functioning society. The societies which contained individuals who were incapable of acting in society’s best interests lost. This raises the intriguing question – do society’s aims and an individual’s aims align? Not always. This is explored in a separate essay. As memes go, you might argue that not every meme is society controlling us. That’s true, it was natural that some memes would simply play into psychological needs and survive thus. The question is, are those psychological needs meant to serve society or to serve ourselves? Just as we have genetics and culture, we must have societics. The study of how societies evolve. Societies live and die, and each new society passes its knowledge down to the next society. Knowledge is inherited between societies, and every society is a refinement of that which came before. An example is the American Constitution. Its drafters studied political systems that came before to formulate it. Every society is built upon those that came before, and it is an inheritance of, and a refinement, of the cultures that built the previous societies. In particular, large, complex societies need a complex, highly developed culture to sustain, coordinate and drive the activities of the people within it, to create the necessary structure to ensure the society functions. Societics would be the study of culture across societies and the inheritance and spread of culture. This corresponds to the field of anthropology. Eventually, every society will gather adaptations that are too fixed and rigid to be changed. These adaptations will fit the environment at the point of adoption, but will gradually fall out of fit with the environment due to their unchanging, rigid nature. Finally, there will be enough of them such that they attain critical mass, and that society will fail. The only manner of doing away with fixed, deep rooted adaptations is revolution. Revolt is a natural process in a society’s life, one that maintains a society’s health and is necessary at times. The thrust of this essay is that society is a living organism. It does contain properties of conscious life. A society acts to further its existence. It reacts to an environment, and protects itself. It produces progeny in the form of successor societies. Yes, evolution occurs at the genetic level, but it manifests at the societal level because the individual is contained in society. We are eusocial. Culture is the mechanism by which a society self-organizes, and adapts. Small world networks and narratives form the basis for culture.